The Barbary ape has long been a player in geopolitics. Take Gibraltar: Legend has it, the British will relinquish control of the Rock only when its Barbary apes have died out. During World War II, Winston Churchill (a believer of legends, apparently) ordered that the dwindling ape population of Gibraltar be reinforced. The Barbary ape’s two other homes, Algeria and Morocco, are, like Gibraltar, gateways between Europe and the Middle East. They are both nations that have struggled for independence from a Western power, both hotbeds of Islamic extremism. It’s fitting, thus, that the Barbary ape (actually a tail-less macaque) should be stationed on the front line of this clash of civilizations. It’s the only free-range monkey ever to make it to Europe, possibly as a tagalong of Muslim empire-builders in the Middle Ages. Origins aside, its naked, pale-pink face makes it a natural symbol for European imperialism. And now that George W. Bush has revived imperialism under the banner of “preemption,” the Barbary ape, also known as “Magot” or “Macaca sylvana,” is back in the thick of things. In the fall of 2002, al-Ubsu’ al-Siyass, a weekly newspaper in the Moroccan capital of Rabat, reported that the government there had offered to donate “2,000 monkeys [read: Barbary apes] trained in detonating landmines” to the U.S. military in Iraq. The story was picked up by UPI, repeated on CNN and The Daily Show, and slobbered over by legions of bloggers. The Moroccan Communication Ministry called the report “whimsical and unfounded,” but by now we can all detect the wink in official government pronouncements. Uranium from Niger, anyone? Fact: In Malaysia, macaques are routinely trained to pick coconuts. At about twenty-four inches long (fully grown), Barbary apes are just as nimble and capable of precision work with their hands. Witness their meticulous social grooming: they spend up to five hours a day plucking the loose matter from each other’s yellow-brown fur. More than just a demonstration of manual dexterity and martial attention to hygiene, the nit-picking promotes group cohesion. When stress threatens the peace, an adult will grab the nearest infant and give it a good once-over, chattering until calm is restored. 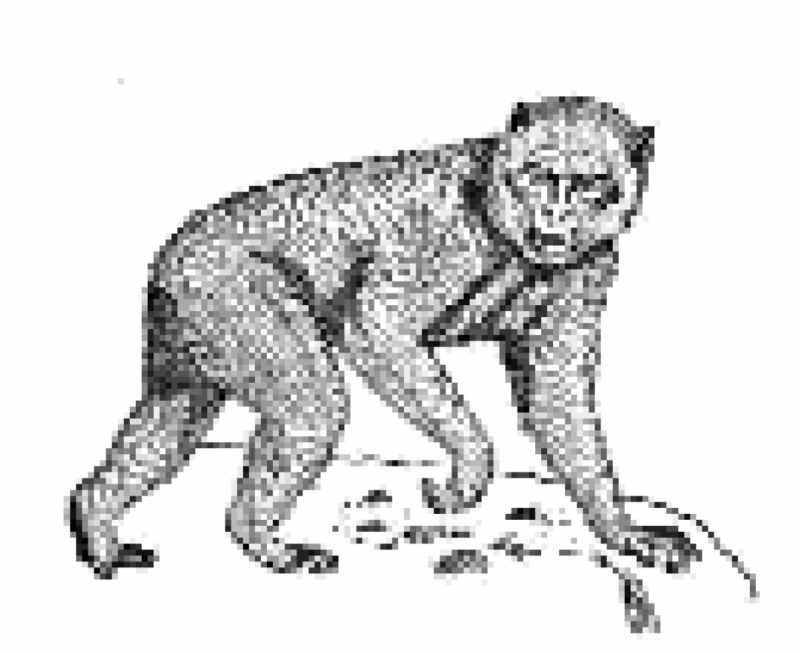 This coping mechanism, unique to the Barbary ape, bespeaks a team concept ideally suited to special ops. Fact: Members of the animal world are fast becoming the new SEALS. Makai and Tacoma are not the lost spawn of Bruce Willis and Demi Moore; they’re bottle-nosed dolphins trolling the Iraqi port of Umm Qasr for mines. If the military gets its wish, they’ll soon be joined by sea lions able to attach a clamp to the flippered feet of a scuba-diving Al Qaeda operative. Then there are the forty-two chickens deployed on the hoods of Humvees across Kuwait. Their mission? To die in a chemical attack before any Marines do, the proverbial canaries in a coal mine. Most of the chickens have since plotzed under mysterious circumstances (the Marines think flu) and been replaced by pigeons. And maybe, even as you read this, the Barbary ape is about to join the fight, too. Maybe the Moroccan government obfuscated because the apes, like some of our Arab allies, don’t want to be publicly associated with such an unpopular campaign. If the al-Ubsu’ al-Siyass story is accurate, some of the monkeys in the bomb squad come from the Atlas Mountains—haunt of the Barbary ape—while others had to be imported. Maybe the Barbary apes, always caught between two worlds, couldn’t afford to be known as the ones who dragged their fellow monkeys into a neanderthal’s war. Much to his own chagrin, Daniel Browne is not the author of The Da Vinci Code. He grew up in West Palm Beach, Florida, spent nearly twenty years in New York City and now lives in Birmingham, Alabama with his wife Lisa, son Theo and toothy mutt Mabel.